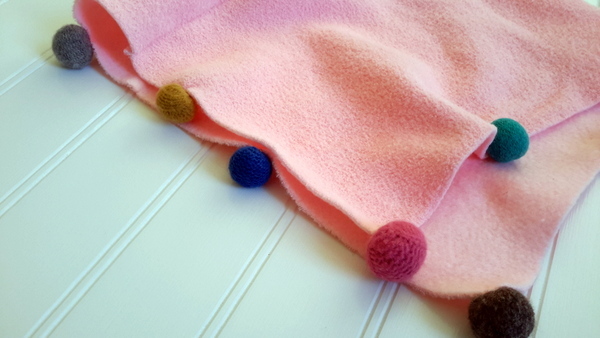 I hope you have been saving the sweater scraps when you are cutting out your sweater mittens, slippers, or other felted wool projects, because I am going to show you how easy it is to make these adorable upcycled felted wool sweater balls. Who would have thought that you could still do something with a 3 inch piece of sweater. 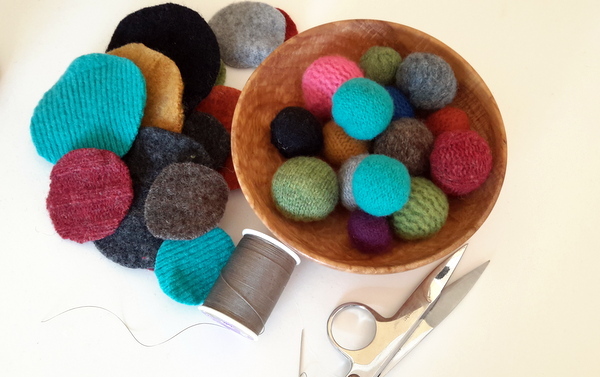 I don’t throw any of these precious scraps away, even the littlest pieces get saved for laundry dryer balls. 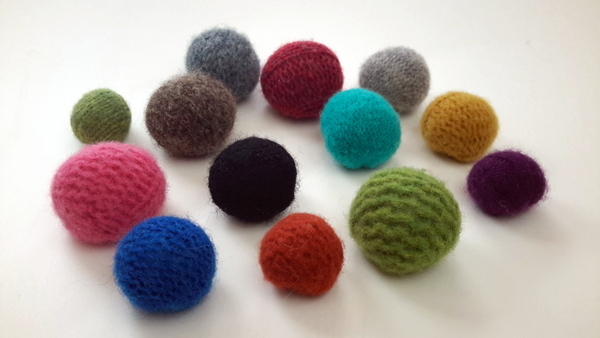 You are probably wondering what you do with a bunch of balls made with sweaters. Instead of yarn pom poms on my elf slippers, I find a cute sweater color and make a sweater ball. Look how cute they look just sitting in a bowl. Add a little color and texture to any room. 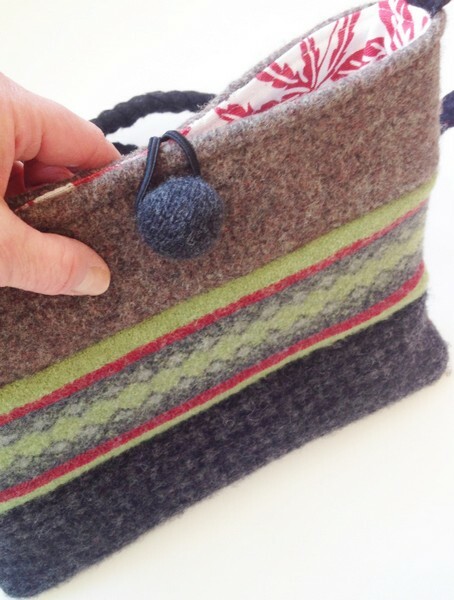 I have used them for a button on my tablet purse……. 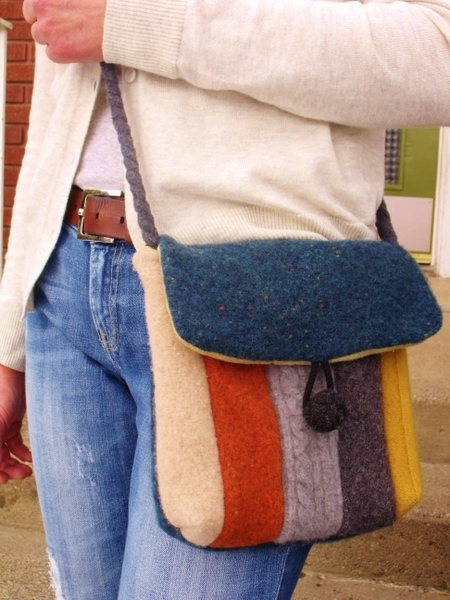 …and on my “hip purse”. Look how cute they look sewn to this little girl poncho. 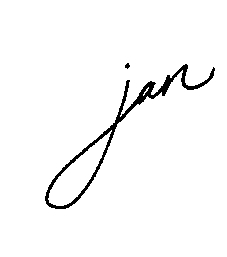 Here is a quick tutorial on how easy it is to make this little gems. 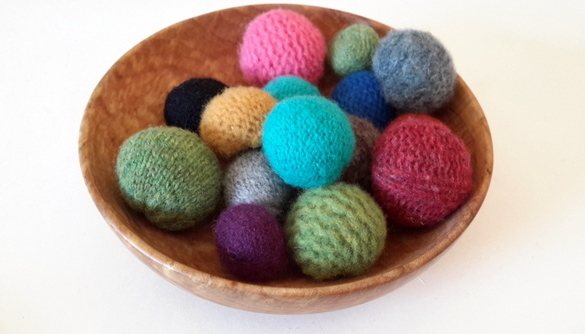 I know you can make similar balls that are more uniform using special wool fibers for “felting”, but I find these have a little more character, because of the different sweater textures and stitches. I am hoping to have enough soon to make a fun garland. 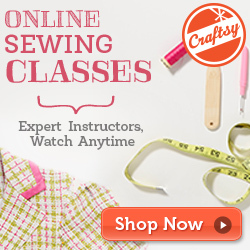 Get your tote of scraps, a pair of scissors, a good movie and cut away. 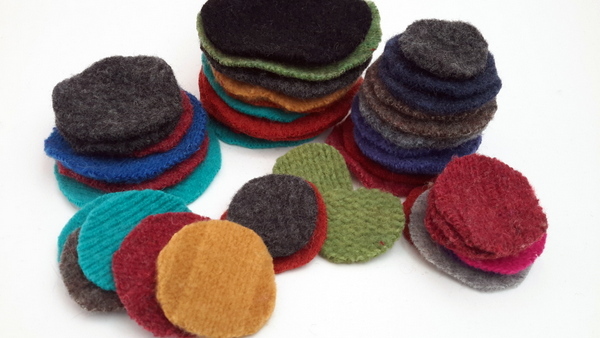 I like to keep a plastic zip bag full of wool circles, thread and a pair of scissors. It makes a great on-the-go project. (For those of you who like to take advantage of down time while traveling, chilling out, or those fun stays in waiting rooms). I would love to see if any of you have any other great ideas of how to use these cute little fellas. Send me your ideas or better yet, send me a snap of your creations.